Happy Boston Marathon day!! I'm currently listening to coverage play in the background while I write this post. Unfortunately, I am not going to be able to watch much of it since I interpret from 10am to 12pm, boo! Run fast and strong, runners! 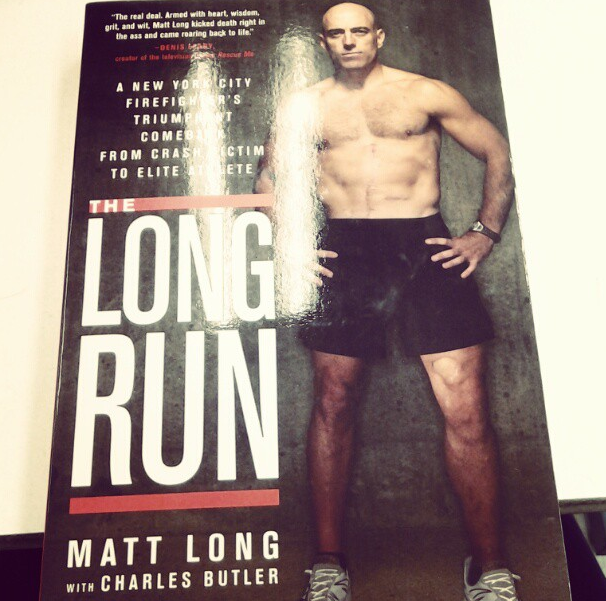 April's book was "The Long Run" by Matt Long, a firefighter, marathoner and Ironman from New York City. Long's story begins on a November morning where he is toeing the line at the New York City Marathon. As a member of the FDNY it was his mission to help beat the NYPD in a friendly competition, and he also wanted to qualify for Boston. Not only did he come in the top five for the FDNY, he also ran a 3:13 marathon which was fast enough to get him a golden ticket to Boston. Unfortunately for Long, he would never make it to that marathon. On a cold day in December in 2005, during a transit strike (which was illegal) and a city ban on cars driving in to Manahatten during rush hour with less than four passengers, Matt Long decided to ride his bike to go workout and then go to work with fellow firefighters. Shortly after, that was when his life changed. Long was struck by a 20-ton bus making an illegal turn and sustained numerous injuries including his bike's seatpost ripping through his midsection, broken bones and loss of blood. Doctors fought to keep Matt alive, but he wasn't given a very high survival rate in the beginning. Doctors learned that he was an endurance athlete, and believed that is why he even had a fighting chance, and even then the survival rate was very low. The book goes through Matt's childhood, how he got into endurance sports (a friend called him a chicken when he asked him to do a triathlon with him) and his life as a firefighter (he worked through 9/11) and bar owner. In addition, it talks about the extent of his injuries after the accident, physical (and mental) therapy and how he got back to being an athlete like he was before the accident. Matt was determined to run again, and to do triathlons, and after going for intensive physical therapy in Arizona (where he took his first running steps three years after his accident) he decided that he was going to run the NYC Marathon again. The remainder of the book talks about how he trained for and ultimately finished the NYC Marathon in 7:21, more than double the amount of time it had taken him the last time he ran the race. If that wasn't enough, Matt felt that he couldn't be who he was as an athlete if he didn't try to finish an Ironman again. He returned to Lake Placid (where he had done his first Ironman the same year he qualified for Boston) and finished in 16:58, barely making the cutoff time. I really have no criticism of this book and I think that anyone who considers themselves an athlete, endurance or not, needs to read it. What Matt went through to get back to the athlete that he was before the accident (although very different at the same time) was remarkable. I will definitely be thinking of his strength and determination during the Cleveland Marathon, Musselman and the MDI Marathon. He truly proves that if you put your mind to it, you can achieve anything. Have you ever overcome any physical limitations/injuries in order to achieve something that most people told you would be impossible? Matt relied on his family, friends, co-workers and strangers to help get him through, who do you lean on in times of hardship? At first Matt did not want to admit that he was a different athlete than the one he was before the accident, but eventually he joined the Achilles team (a team for disabled athletes). Would you do the same if it meant you could continue to race? After his accident, Matt tried to find a way to give back and eventually he founded I Will, a foundation dedicated toward helping individuals overcoming life-altering injuries and illnesses. 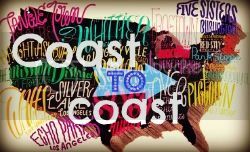 Have you experienced something that sparked the need to give back, sports-related or not? I hadn't seen his IM finish video before, makes me tear up.....thanks for sharing Jamie! I reviewed this book last year (http://climbingthosehills.blogspot.com/2012/03/book-review-x-2.html). I really liked it. I overcame obesity to finish my first sprint triathlon (even while still pretty overweight). I've relied on my friends and family to support and encourage me along the way. I still struggle with not feeling I am an "athlete" - still almost always at the very back of the pack. I'm sure going from nearly elite status to handicapped was a bitter pill to swallow for Matt. Anyone who finishes an Ironman is a superhero in my book - those that do it with any kind of "extra" hardship is out of this world. I love these inspirational stories. That was one of the most powerful books I have read! So amazing! I started running to remember my dad - the Colon Cancer Alliance does a 5K called the Undy 5000. I signed up to walk it and was goaded into running it. I've not looked back, but I have only participated in charity events thus far. It keeps me grounded and humbled. Hopefully if my physical situation changed, I could continue to go forward. Thanks again, Jamie - what a great read!